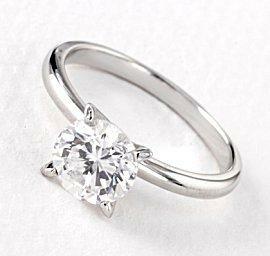 Choosing the right type of ring can take careful thought, and there are many factors to consider. Along with traditional styles, many other types of rings are worn, from antique to contemporary. Some couples consider each of these characteristics carefully before choosing the perfect ring, while others focus on one or two characteristics that may be most important to them in order to choose the engagement ring that suits both their personalities and budget. No single type of engagement ring is suitable for every person. Before choosing a ring, it is best to consider your budget, jewelry preferences, and the overall appeal of different styles. An art deco ring may appeal to a woman who treasures uniqueness and bold statements, while a Celtic ring may fit with another woman's family heritage. Some women prefer unique shapes such as Asscher or cushion cut diamonds, while others opt for the symbolic arrangement of three stones. Some types of engagement rings move far beyond traditional styles. Couples may opt for both partners to have engagement rings, which means finding men's engagement rings, while others may be involved in a very long engagement where a promise ring is more appropriate. Heirloom rings are another option, or couples may find antique or estate rings to begin their own heirloom tradition. Whatever the final choice, the most important thing to remember is to choose an engagement ring that represents your unique relationship and can serve as a focal point as you begin many years together.